We provide numerous mobility solutions for people across Denton and Collin County – including college students looking to get to school! 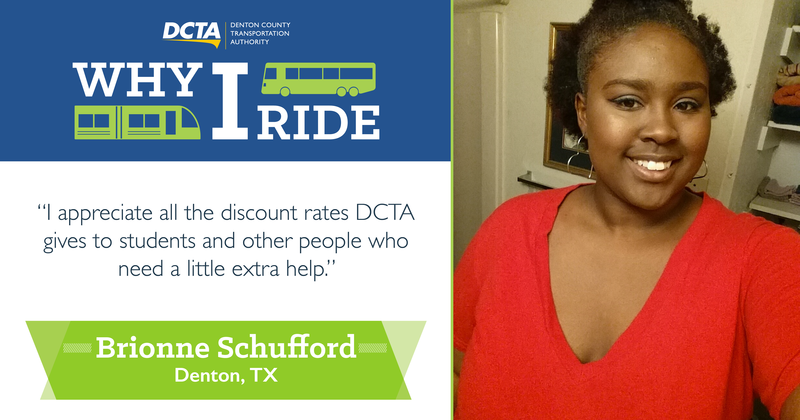 Denton resident Brionne Schufford uses our services to get to her classes at the University of North Texas (UNT), her job at Panera and all around the city. Since she is so familiar with us, she provided great advice for current and future riders and why she likes to #RideDCTA! A: I like to listen to music, play a game on my phone or stare out the windows. I do not do much except enjoy the ride or occupy myself with a device. A: Pay attention the patterns of all buses and trains, arrive at your stop early and do not push time because you will get left. Ask DCTA’s customer service or employees questions [if you need help]. A: Riding DCTA is not as time consuming as I thought it was going to be. It is very easy to use and all the bus drivers are friendly, safe and confident. I also appreciate all the discount rates DCTA gives to college students and other people who need the little extra help. A: I am currently studying in the college of business at UNT and my major is aviation logistics. I am from Cedar Hill, Texas. I work at Panera bread in Denton and back at home. Thanks for sharing with us, Brionne!